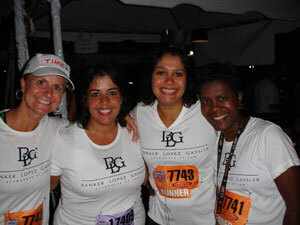 Banker Lopez Gassler joined 17,000 racers from businesses all around Central Florida as they ran/walked the IOA Corporate 5k through downtown to build camrederie and race for charity. The 18th Annual IOA Corporate 5k presented by News 13 and Bright House Sports Network, Orlando’s largest office party was the place to be on Thursday, April 12th, 2012. The 83 degree weather was perfect for a 5k through downtown, with record participation from local companies and organizations. Over 100 teams recorded their finish times and are listed in the 2012 results. Congratulations to Seliena Crampton, Michele Johnson, Nisha Waranch, Melinda Maldonado, Patricia Spies and Donna Hinkley.